The art of ceramics in Rishtan emerged and flourished in one of the most picturesque oasis of Uzbekistan - Ferghana Valley. The history of its emergence, described in numerous legends, is still to be discovered by archeologists. 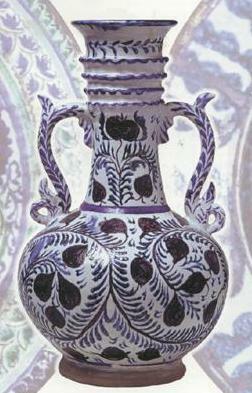 The people of Rishtan have introduced colorful and unique features in the art of burnt clay that existed since time immemorial. And their works can be clearly distinguished from anything that has been created in this field not only by other peoples but also by masters from other Uzbekistan centres of ceramics. The traditions of most of those centres still in existence at the beginning of the 20th century happened to be lost by the end of the century. In this respect modern Rishtan handicraft represents a certain phenomenon of stable development of this traditional craft which has been preserved for more than 800 years, practically without any changes, its unique stylistic indivisibility: the charm of free painting, the richness of vegetarian ornament and its peculiar coloring with all the shades of azure and turquoise. During the last two decades following its ups and downs the ceramics of Rishtan remained first among all the Uzbekistan centres of ceramic production. In the second half of the 20th century the art of Rishtan ceramic school was enriched by the works of talented masters, who continued the traditions of their ancestors glorifying the Rishtan ceramics at the end of this century. The works from state and private collections are included in the album. Сайт открыт 16 января 2000 г.
Проект независимой творческой группы "Фергана"